Roundtable is a monthly program offered by districts that gives leaders hands-on experience and provides a forum for leaders to offer and receive help from their fellow Scouters. Roundtable is a form of supplemental training for volunteers. The objective of Roundtable is to give leaders program ideas, information on upcoming events and trainings, and an opportunity to share experiences and enjoy fun and fellowship with other Scouting leaders. As a result of the roundtable experience, unit leaders will be inspired, motivated, informed, and able to provide a stronger program for their Scouts. Roundtable is a form of commissioner service and supplemental training for volunteers. The objectives are to provide leaders with program ideas; to update information on policy, events, and training opportunities; and to offer an opportunity to share experiences and enjoy fun and fellowship with other Scouting leaders. The roundtable staff inspire, motivate, and enable adults to provide a stronger program for their Scouts. The breakout sessions explore a particular activity or area of interest. Leaders are encouraged to share their questions, their successes and their failures (usually the latter is the most instructive!). Helping you, the Scout leader is the sole purpose of roundtable. Who should attend? Everybody! Roundtable is designed for all leaders – Scoutmasters, Cubmasters, Webelos leaders, committee members, assistant Scoutmasters, den leaders; every Scouting position has a place at roundtable. In the Cub Scout session, there are separate break-out programs for Wolf and Bear leaders, Webelos leaders, Cubmasters, and pack administration. 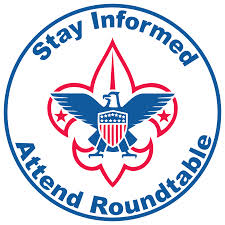 Whether you’ve been in Scouting for 40 years, or just signed up last week, roundtable has a lot to offer.